We’ve been harvesting the first of our spring turnips and I have been eying this recipe for turnip salad out of Joshua McFadden’s new cookbook Six Seasons of Vegetables for a long time now. After flipping through the cookbook I immediately bookmarked a handful of recipes but this particular one really stood out. It’s full of wonderful flavors and textures and I love that the turnips are served raw. This is a great recipe for folks who are a part of a CSA or frequent shoppers at the farmers market because the turnips used here are the Japanese variety (Hakurei) also known as salad turnips. These turnips are sweeter than the traditional storage turnip and are usually in abundance at the market this time of the year. This salad is fresh and full of bright flavors and I hope you all enjoy it as much as we do. It would be perfect served alongside grilled chicken or steak for a simple springtime meal. Slice the turnips lengthwise as thin as you can. If you have a mandolin, use it; otherwise a sharp knife and steady hand will do just fine. Soak the sliced turnips in ice water for 15 minutes then drain them very well. Rinse, dry and roughly chop the turnip greens. If the greens seem like their old or not in the best shape you can quickly saute them in olive oil. Put the turnips in a large bowl and squeeze half of the lemon. Add the chili flakes, 1/2 teaspoon salt, and plenty of black pepper and toss to blend. Add the yogurt and toss again. Add the herbs, scallions, and 1/4 cup olive oil and toss again. Taste and adjust seasonings as needed. 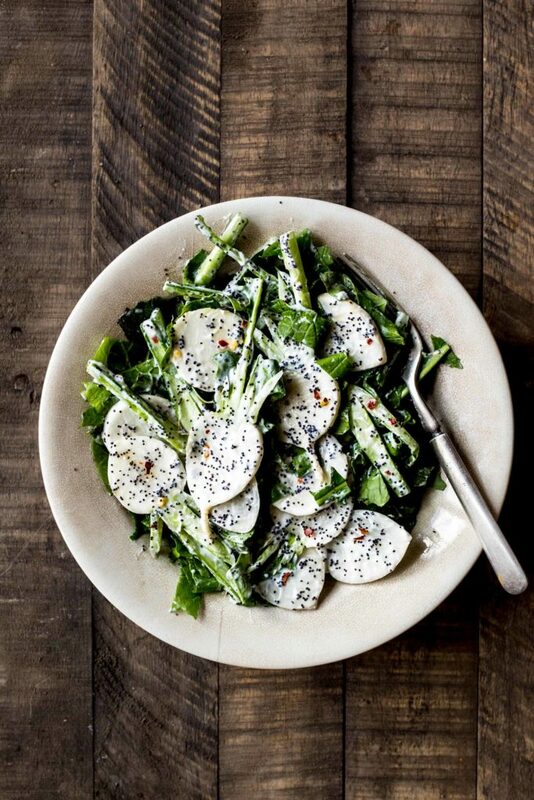 Scatter about half of the poppy seeds on the bottom of the platter or individual serving plates, top with the turnip salad, and finish the the rest of the poppy seeds. Serve right away. I bought the book after seeing your post (Instagram ?) on this recipe and I’ve made it with my own CSA turnips – wonderful! And there is some great inspiration in the Six book but let me just say that I far prefer your take and tone on all things vegetable/farming/cooking/life! Recipe arrived just right in time for a veggie-burger BBQ night with friends.Since I couldn’t get any turnips, I used red radishes. What a delight! Spring has finally arrived!